Not without reason are we called a cricket-crazy nation. Nothing compares to the grip that cricket has over the nation's imagination. People adore the game like no other, cricket is a religion here and the cricket stars enjoy demi-god status. The game has seeped into our daily lives in such a way that the country almost comes to a grinding halt when the National team is playing an important match. While close to a billion Indians watch the cricketing action on their TV sets, some forty to fifty thousand cricket fans thronging the stadiums with lively excitement is a usual fare. It is almost impossible to imagine a low turnout at a cricket venue where India would be playing. Invariably every match involving India is bound to have a jam packed stadium, no matter which part of the world the match is being played. Even when the matches are being played abroad, one would still find a good number of Indian fans inside the stadium who would have come to support their team. Of course there is a sizeable Indian community living all over the world but it's not just the Indian expatriates who throng the stadiums to watch an important match involving India. In fact it's pretty common nowadays to see Indian fans travelling abroad just to watch their team play. Like it happened during the group match against South Africa at the Melbourne Cricket Ground in this year's world cup. Though theoretically it was a neutral venue for both the teams, but such was the support for the Indian team that one felt as if the match was being played at the Wankhede Stadium in Mumbai! It was jam-packed and was a sea of blue all around inside the stadium. The Indian fans don't mind waiting for hours on end outside the stadiums to get inside, nor do they think twice before paying through the nose for their tickets. Long queues, sometimes even stretching up to the end of the roads, is a common sight outside the venues for a match involving India. And those cricket fans who fail to buy a ticket, resort to other options to stay updated with the live action. Like some people who live nearby a cricket venue sometimes get onto their rooftops to get a peek at the cricket match! 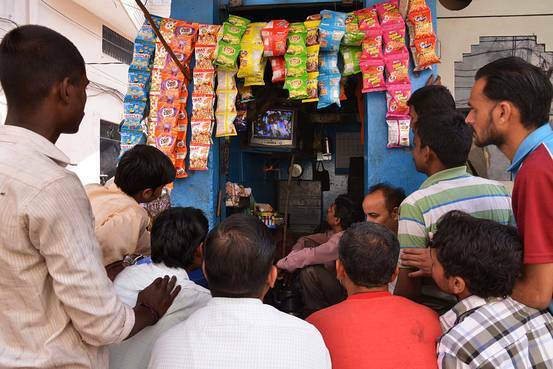 It's also a common sight to find a horde of cricket fans outside a TV dealer's shop or a restaurant or outside a pan-beedi shop when a match is on. They mayn't be able to hear the commentary but they still flock outside, watching anxiously and rooting for their team. Times are however changing and with the advancement of technology (internet and the advent of smartphones), people now no more depend solely on their TV sets or radios to catch the live cricket action. They can now get the latest scores and other cricket updates on their smartphones. Nowadays some cricket matches are also being streamed live on the internet and so one can watch them either on their computers or on their smartphones! But to access internet on a smartphone, one needs a fast enough internet connection and an equally fast and smooth browser as well. That's where this new browser, "UC Browser", stands out from the rest. It is not only fast but is also very easy to use - it has got a simple interface but with seamless transitions, it provides all the features that one would need to have a smooth browsing experience. Move over the other default browsers and instead choose UC browser because it gives an all-in-one web experience -- one can search, browse, download, watch videos, play games, do online shopping and so also can access all social media at really fast speeds. 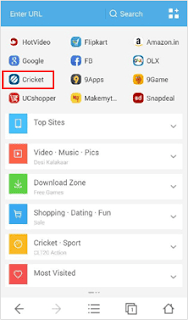 UC Browser also features UC Cricket which is a space dedicated for every cricket fan. 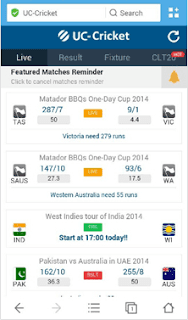 It enables an user to know about the live scores, get instant updates and also play guessing games even when he is on the move. Thus one can stay updated with a cricket match, no matter where the match is being played or wherever he currently is. With UC Cricket, staying updated with the latest cricket scores is fast and butter smooth, it was never this easy before. 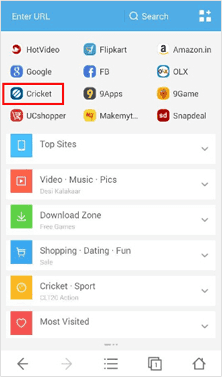 Now a cricket enthusiast won't have to worry about buffering of videos and slow playback. Nor does he need to google every now and then anymore, to check on the latest scores. 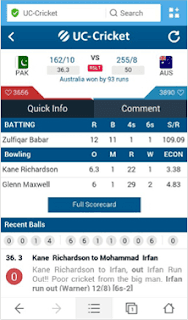 With UC Cricket, one can not only know about the live scores (that get updated automatically) but he can also find all the latest news about cricket, about the fixtures and the results of the recently played matches and so also can watch cricket videos. 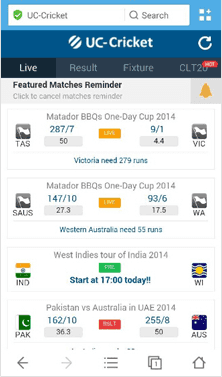 Thus UC Browser provides the best cricket service in India. One only needs to download the UC Browser to stay updated with the live action (cricket match) while still continuing with his other works! I have written the above post for UC Browser that lets one to "Surf it All! Surf it Fast!". 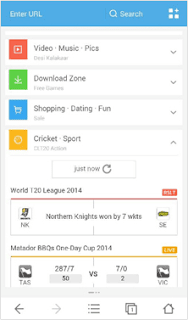 It features UC Cricket which is a space dedicated for every cricket fan, connecting them to the match wherever they are. You too may visit their website to know more.